Periodontal disease and its associated systemic diseases have gained public attention due to their increasing global prevalence. Still, the gold standard for the management of periodontitis is scaling and root planing (SRP). However, bacterial recolonization is considered a limitation of this approach. Further, the efficacy of adjunctive agents such as antibiotics, antimicrobials, and probiotics has been investigated extensively. Nowadays, drug resistance development due to antibiotics and antimicrobials abuse has become a global problem and our concern. In order to reduce the spread of drug resistance development, many investigations have been focused on the use of nutritional compounds rather than synthetic drugs for treating periodontitis, a relatively low-grade inflammatory disease. Moreover, if periodontitis is understood as a bacterial dysbiosis-induced inflammatory disease, then its treatment could be designed not only to eliminate periodontopathogens, but also to modify the host immune response. Therefore, this review will highlight the effectiveness of some pertinent nutrients towards periodontal condition. Nutrients are known to possess anti-inflammatory, antioxidant, and antimicrobial properties that maintain homeostasis. In vivo and in vitro studies have demonstrated the positive effects of nutrient intake on the maintenance and restoration of periodontal health. Vitamins, fatty acids, and probiotics are increasingly being found to have remarkable benefits and valuable properties. 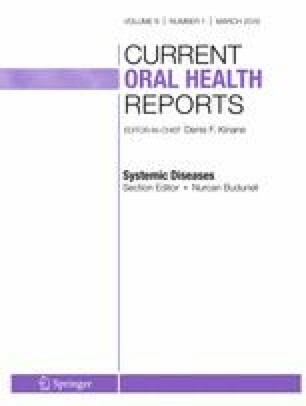 Further, considering the oral-systemic connection, nutritional supplementation is encouraged as a possible adjunct therapy for the improvement of both oral and systemic health. Gutiérrez-Venegas G, Torras-Ceballos A, Gómez-Mora JA, Fernández-Rojas B. Luteolin, quercetin, genistein and quercetagetin inhibit the effects of lipopolysaccharide obtained from Porphyromonas gingivalis in H9c2 cardiomyoblasts. Cell Mol Biol Lett. 2017;22(1). Doi: https://doi.org/10.1186/s11658-017-0047-z.